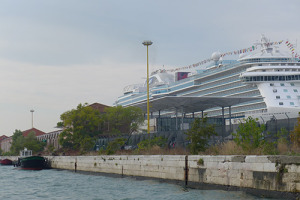 Just when you thought a definitive program had been adopted, albeit with protests, there is a new proposal being discussed in Rome regarding the presence of Cruise Ships in Venice. And subsequently a push by certain political groups to simply railroad their “Twisted Channel” through has occurred.. 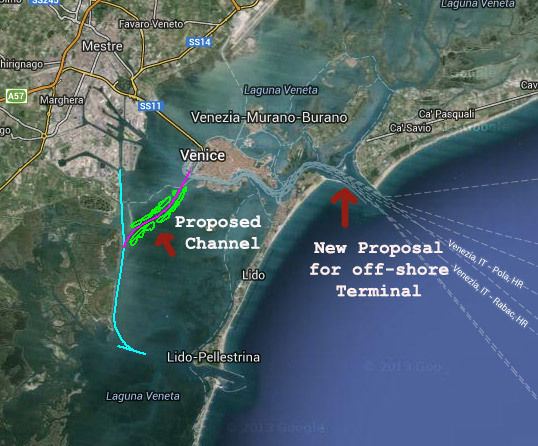 In the beginning of August, a vote was taken in Rome which adopted the dredging of the so called “twisted” channel (Contorta-Sant’Angelo Channel) which makes use of the Petroleum Channel with a widening of an existing channel (the light green in the picture) to arrive at the Maritime Port. It prevents the large ships from cruising past San Marco and the Giudecca Canal to an enlarged entrance on the other side of the Lido (Chioggia side). The proposal authorized the acceleration of the environmental studies required. This brought about cries of foul play, as everyone knows that in August there are no citizens in Italy and that all the elected officials are on holiday! It at least solved one very urgent problem, that of the mega cruise ships entering anywhere near San Marco Square. Even though they voted, it was not a done deal. There were still environmental studies and the estimated cost of some 115 Million Euro and 18 months to be resolved. But even before the ink was dry on the paper, other proposals, clandestine perhaps, often involving elected officials, began surfacing. This week in Rome, a new proposal was put forth by Dufero Engineering of Genoa – called a “Bold Alternative” supported by Cesare De Piccoli, the former vice mayor of Venice and former Deputy Minister for Transport under the short lived Prodi administration. This “bold” project sees a remote Cruise Ship Port built at the entrance to the lagoon, near the island of Lido and the man made island of the MOSE. (See on the picture where the new proposal is marked.) The capacity envisioned is to handle 5 large ships, ~940 meters long and handle more than 24,000 passengers a day. 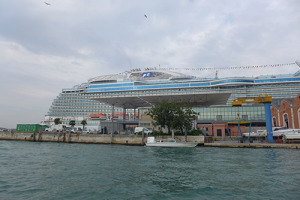 Arriving tourist would board on large catamarans which would cruise them along the scenic route of San Marco Square and to the Stazione Marittima. They would be processed through Customs/Immigration here both in and out. Perhaps this project has a chance if they can get UNESCO to buy into it as it has more political backing, does accomplish the main goal of preventing irrevocable damage to San Marco and perhaps the environment yet appears to appease the merchants of Venice as tourists would be delivered daily to the shops. Perhaps it also adds some jobs. Even though I am completely skeptical of any of the players in this theater, I could get behind this one. From the environmental impact I understand just how fragil the lagoon is and that it is a precious eco system, however for me, the greater concern is San Marco.